RDB serves both patients and hospitals to protect the patient through the entire operative experience, before, during, and after surgery. RDB offers a unique, comprehensive decolonization program that can reduce the risk of infection by approximately 50%. RDB identifies and reports patient Enterococcus and S. aureus with optional Klebsiella, Acinetobacter, Pseudomonas, and Enterobacter (ESKAPE) colonization status directly to the patient for the purpose of guiding evidence-based decolonization strategies prior to surgery. RDB’s HIPAA and CLIA compliant medical laboratory utilizes OR PathTrac technology to efficiently process and catalogue bacterial samples that you provide through use of simple RDB collection kits. Unique bug identification numbers generated by OR PathTrac will serve to identify organisms that through consultation with Dr. Randy Loftus at RDB and with your local physician, you can eradicate infection-causing bacteria with simple, effective steps prior to surgery and use to better understand your surgical risk. Our program can compare later samples following your healthcare exposure to assess for transmission of new pathogens during your hospital stay. Work with RDB to decolonize today to cut your infection risk by more than half. After surgery, RDB serves patients and the community to limit spread of bacterial pathogens acquired during care. RDB is also engaging hospitals to implement bacterial surveillance so that OR hand hygiene, intravascular device design and handling, environmental cleaning, and maintenance of the sterile surgical field can be optimized in order to prevent spread of dangerous bacteria between patients undergoing care in the same arena. Ask your hospitals to ensure that measures are in place to reduce bacterial spread between patients so that you don’t get someone else’s “SUPERBUG” to bring home. RDB is happy to consult with you to review hospital safety check list results to help ascertain quality of infection control services offered. If a given hospital is unable or unwilling to complete the provided safety checklist prior to your surgery, keep in mind that as opposed to the 1800’s, the impact of transmission of deadly bacteria is clear. It is up to you to decide whether you want to take that risk. Demand a culture of patient safety at any hospital that compromises your first line of defense against infection with the incision and your second line of defense by suppressing your immune system with inflammation, medications, and anesthetic agents. Why use the Home PathTrac service? Once we help you determine if you are carrying a superbug, and determine the characteristics of it, we work with you and your doctor to determine the risk. The best time to reduce the risk of Healthcare Associated Infections is prior to surgery. We work with you and your doctor to determine the course of action recommended reducing your risk of infection. Simple steps prior to surgery can make an enormous impact on your outcome and overall health. RDB Bioinformatics is lead by Dr. Randy Loftus, a board-certified anesthesiologist. We provide you with a report that communicates to your doctor everything he or she needs to continue your health plan. If required, our medical professionals will communicate with your doctor directly to determine the course of action. Many times, part of the preventative measures involve antibiotics. Determining which antibiotic is our job. We report to your doctor, who then in cooperation with RDB Bioinformatics can determine the best antibiotic for your successful decolonization. Even without a planned surgery ahead, a simple cut to someone carrying S. aureus, or even worse, Methicillin-resistant Staphylococcus aureus (MRSA), can easily cause infection. If you think your infection rate at home is higher than it should be from the simple paper cut or kitchen “mistake”, then use the Home PathTrac system to determine if you carry a superbug. Proactive decolonization now can prevent problems later. After a failed attempt to decolonize your body it may be necessary to check your home environment. You may be experiencing a bacterial transmission from your home and specific cleaning measures can prevent further transmission. Through a similar process to the home PathTrac kit and OR PathTrac kit, we can survey your home for specific points that are known to be involved in bacterial transmission. How do I find out if I am carrying a superbug bacteria and protect my loved ones? 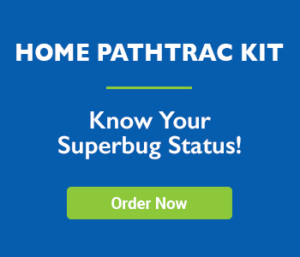 Begin by purchasing the Home PathTrac Kit. You’ll receive an email with more information. We will ship a collection directly to you. There are easy to follow directions in the kit. It is 3 simple steps and you can collect the samples in your home. Then, return the kit in the prepaid shipping envelope. Our lab will process your samples, and you will receive a report to give to your doctor. If you want, our doctors will contact yours directly to assemble a plan of action. Why would a patient select hospitals that use the OR PathTrac service? Hospitals spend hundreds of thousands of dollars each year on preventative measures to protect patients in the operating room. RDB Bioinformatics PathTrac system is the only system that provides a metric proving how effective those efforts are. Our system also provides metrics on problem areas that the hospital needs to work on. Both guide the efforts of the hospital towards your best interest. OR PathTrac combined with prevention efforts at the hospital reduce bacterial entry to the operation room. Over time, continuous efforts to reduce bacterial transmissions reduce infections. The best way avoid a problem is to prevent the catalyst that brings about the problem. The best way to avoid infection is to create a sterile environment and eliminate bacterial transfer. Knowing the common transmission pathways is key. OR PathTrac optimizes both OR and the room afterwards. The patient’s immune system is compromised both in the OR and while recovering afterwards. Keeping the patient safe from the beginning through the end of the surgery timeline shows the investment towards patient safety.